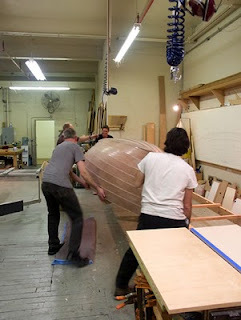 One of the more gratifying aspects of boat building, amidst all of the hard work, is the much anticipated rollover. But first, some thought has to be given in preparation for the event. 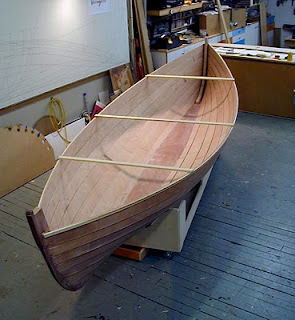 I decided to build a luxury cradle for this boat, on wheels so that she can be rolled around, and as nearly level both fore and aft and athwartship as I could make it. I fitted female molds at two stations, joggled to fit over the laps, and carpeted. This took a little fiddling to get right, but once they were fitted and sitting astride the hull, I set up my laser and shot a level reference line on both molds. I cut the mold bottoms parallel to this reference, pulled them off and built the cradle, adding nice wheels with brakes. Before freeing up the hull from the building jig, I made sure that all of the stations were marked off inside for future reference, and while I had the laser out, I shot the load waterline on the outside. I decided to flip the boat with three molds left in, but unscrewed the rest, and made sure the boat wasn't stuck anywhere! With help from my assistant, Ashok, plus Robert and Eric from neighboring shops, we lifted the boat up and flipped her onto the cradle. I had not thought the cradle all the way through somehow, and consequently the boat's amidship depth was too much for the cradle. Ashok and I quickly cut the cradle down, and lifted her back on. Nice! the ability to roll the boat around is a real plus. 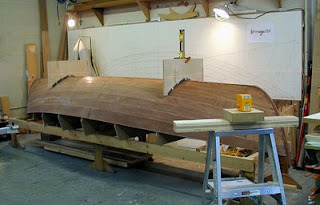 I temp-screwed two of my lining battens around the sheer to even out any local plywood humps or flats, and added braces across the boat to hold the beam and shape intact, then removed the rest of the molds. I was finally able to see the whole shape, and this really is a sweet hull! As I was looking over the hull that evening, it occurred to me that there is much more interior volume than I had imagined there would be. I also realized that I was looking at a potentially blank canvas, and that I can really do anything with the boat that I want. I had fully intended to finish this boat out as traditionally as possible, with frames and solid thwarts, etc, but I may play around with the interior some to create a solo camping beach cruiser. 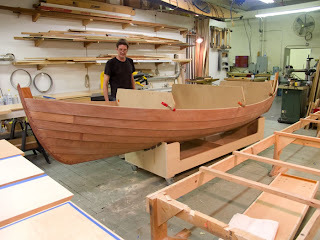 This might entail an off-center board and a level, flat sole, with enclosed side benches for stowage, and bulkheads in the ends. A very different boat on the inside, with perhaps more potential for cruising than the traditional layout affords. Maybe not... There is time to consider all of this as I work out some rig details. Stay tuned. Sorry I haven't been by to visit, Jim - apparently I missed the boat turning by a few months - but it does look good! I suppose you've decided on some interior details by now. 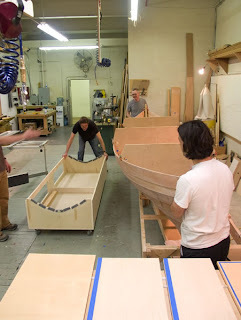 I like the idea of modifying the design for various uses, it's such a versatile boat. 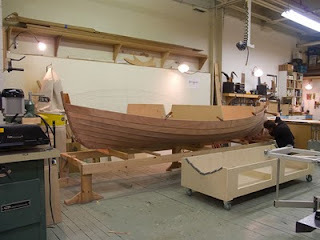 I was wondering how the boat was progessing?